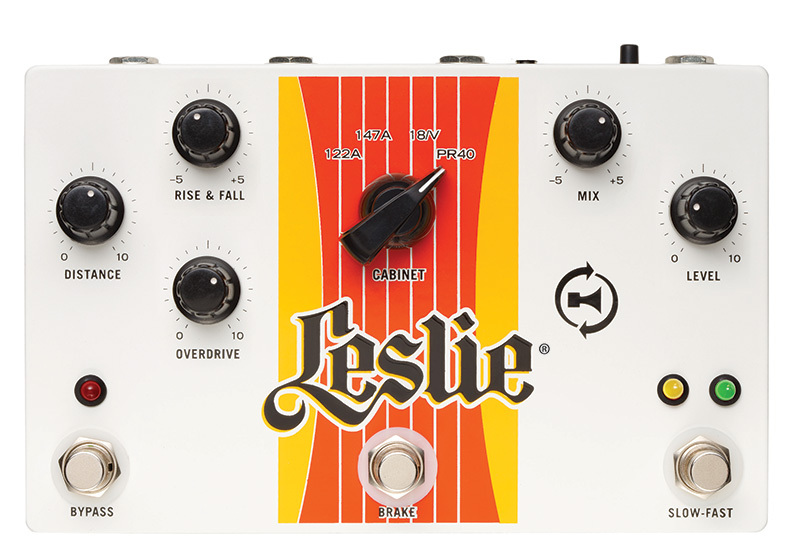 Designed and built in America, the Leslie Pedal allows the distinctive rotary, moving sound of a Leslie to be added to any, guitar, bass, keyboard, or studio rig. vintage 122 and 147 Leslies, and the Model 18, basis of the classic Vibratone Guitar cabinet made famous by Stevie Ray Vaughan and others. The fourth model replicates the distinctive PR-40 stationary speaker cabinet, which was standard issue with Hammond Organs in the 50′s and 60′s, and a “secret weapon” for many vintage studio guitar recordings. Rotary controls allow adjustment of virtual mic placement, ramp up and down speeds, overdrive, horn and bass balance, EQ and overall volume. Three footswitches provide true bypass, speed and brake control, stereo in/out. 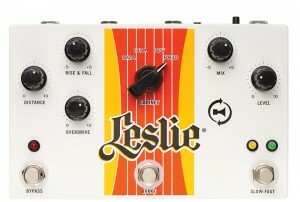 A gain switch allows the Leslie Pedal to be used in a guitar effects chain, or direct inject into a sound reinforcement system/keyboard amp.